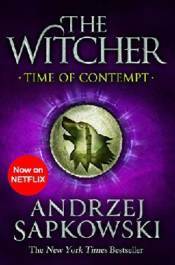 Geralt the Witcher has fought monsters and demons across the land, but even he may not be prepared for what is happening to his world. The kings and armies are manoeuvring for position, each fearing invasion from across the river, each fearing their neighbours more. Intrigue, dissent and rebellion are on all sides. The Elves and other non-humans are still suffering under decades of repression, and growing numbers join the commando units hidden deep in the forest, striking at will and then dissolving into the trees. The Magicians are fighting amongst themselves, some in the pay of the kings, some sympathetic to the elves. And against this backdrop of fear and contempt Geralt and his lover Yennefer must protect Ciri, orphaned heir and sought by all sides. For the prophecy rests on her, and whether she lives or dies she has the power to save the world - or perhaps end it.